Betty is moving to new lodgings in North Baddesley. She is excited to be leaving the house she and her family share with her parents-in-law and Mrs Eddings. Each family has its own floor but the building is crowded and the path to the outside toilet is hazardous in winter! Rationing determines what you can buy, the air raids keep coming and the war impacts everyday life. Betty is travelling between the shops and her home, tired she stops at your school for a rest. She has a range of packages and parcels containing various everyday items and gifts for family and friends. Travel worn and hungry, she may find a snack to eat and unwrap parcels to check and discuss their content. Don’t be surprised if she starts showing the audience how to behaviour 1940’s style. There is no set script for the presentation, it depends on what artefacts or subjects the audience become interested. However, the material can be steered in the direction(s) desired by the class teacher. Teachers can opt to focus on the 1940’s life or steer the conversation to the war. Betty can talk about aspects of 1940’s life to do with medicine, health, food, leisure time, clothing, beliefs, family roles, houses, religion, occupations, towns, entertainments, and laws. 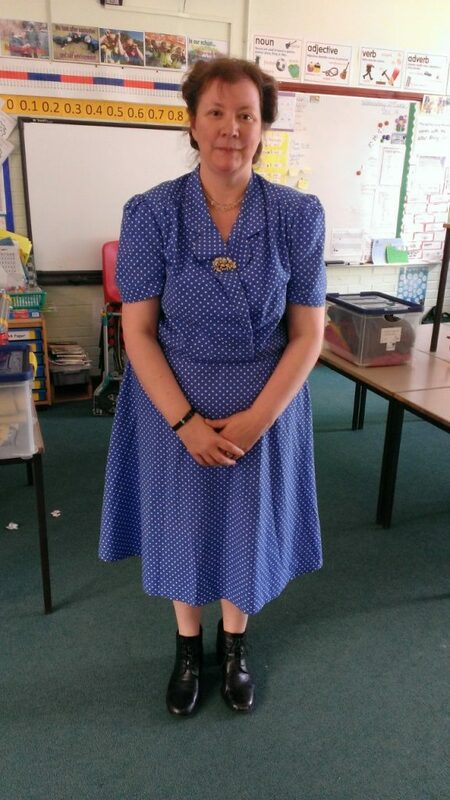 If desired, Betty (or her historian alter-ego) can run workshops with the children in conjunction with the teachers. Or teachers can opt to run these themselves whilst the character works with another group/class. Explore the shopping basket – artefact handling and exploration. Money – go shopping. What would you buy? What would you avoid? Can you make sense of the old money? Toys and Games – try your hand at games that 1940’s children would recognise. Pen, ink, slates and chalk – try your hand at writing the old fashioned way. Tea making – with jugs, hot water and loose tea. Design a dinner, look at what was available from the shop and work out what you might eat for the next few days.